Without knowing anything at all about the gameplay, I’d been looking forward to Little Lost Fox’s Valleys Between for quite some time. I mean, grab a peek at any of their screenshots and it’s not hard to see why. The art style and coloring are reminiscent of Alto’s Odyssey, though it’s an endless grid-based puzzler instead of a runner. My first few games with it were a bit rocky, but after a few days with it, I have a better handle on things. I still have a way to go before I’m any sort of expert, but I think I played enough to share my thoughts on the game. So first off, that artwork. If I’m going to be playing an endless high score chaser, I’m more like to stick with it if there’s some eye candy. And on that front, Valleys Between more than delivers. Like Alto, there are gentle pastels that change with the seasons and time of day. There are weather changes like rain and snow. 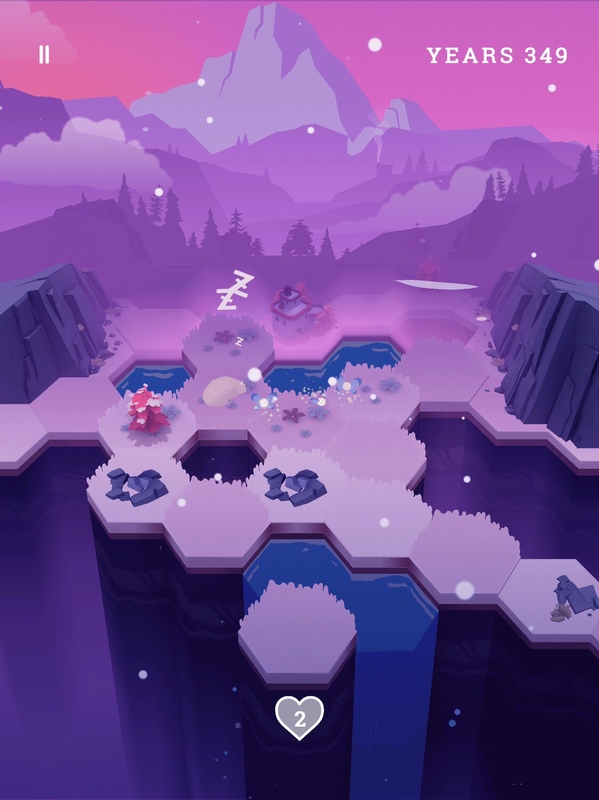 And although the game takes place all in one spot, you can see some things change in the background, like new trees growing or, the moon traveling across the sky, or a fog rolling through. 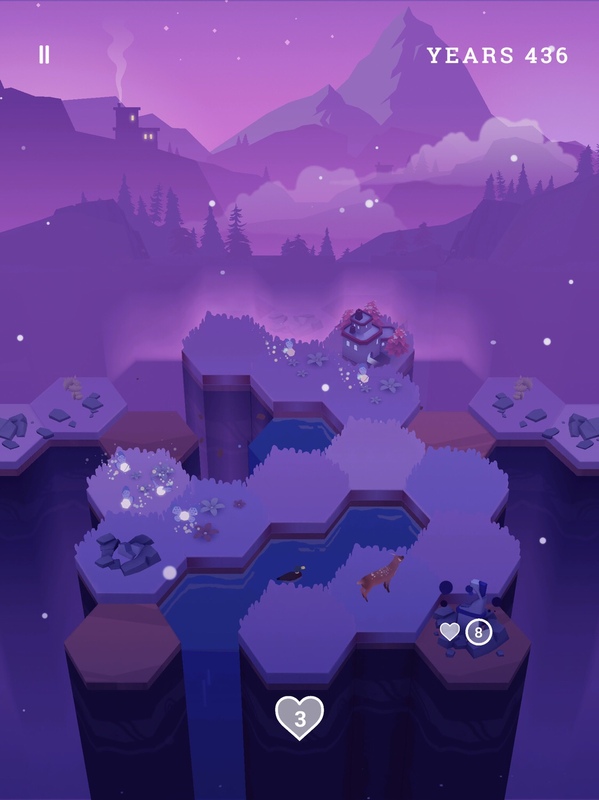 The board itself is hex-based and, as you play, you’ll see grass, trees, houses, and wisps, as well as forest creatures like foxes, ducks, deer, and bears. Even though this is a turn-based game, the animations make it come to life, so I sometimes would forget that I’m not on a timer. Now, I’m going to do my best to explain the gameplay, but it’s not easy. This is the type of game that you don’t really get until you try and fail and try again. The tutorial can only help you so much. But here goes nothing. You start off with a five-by-five grid of hexagons. Yes, this might sound a little like Evergarden, and to some extent it is. But the high score chasing, hexagons and plant-merging is where the similarities end. As relaxing as Valleys Between looks, it’s actually a harsh and unforgiving game, where one or two mistakes can quickly lead to a game over. So you start with a world that consists of twenty-five hexagons. It’s randomized each time, but some of them will have grass on them and one will have a fox. The fox can only move from grassy hexagon to grassy hexagon, and he does so automatically each turn, as long as there’s somewhere for him to go. The fox is very important — I’ll explain why soon — so you want to make sure he has ample space to move around. To create more grass for him, you simply grab and pull up on any ground hexagon. What then happens is that hexagon turns to water and sprouts grass on any ground hexagons immediately surrounding it. It would probably help to watch my video above. The next thing to grow is trees, as they’re almost entirely responsible for your score. To grow a tree, pull up on a grass tile and one tree will sprout up. If you pull up on a tree that’s next to other trees, it will merge with up to five of them and create a forest. Merge two forests and you get a house, which also sprouts some grass and wisps. Merge two houses and you get a village, which sprouts grass and tiles in a bigger radius. For each forest or house you create, you earn years, with the number depending on how many trees were used. The years are your score, so you want to keep growing trees and forests. But the game won’t make that so easy. Each time you create a forest, the board shifts forward and the back row falls off. It becomes unusable. So if you planted some trees back there, they’re gone. If you accidentally created a forest while your fox was on the last row, he’s gone, too. At least temporarily. Except in extreme circumstances, he’ll reappear after a few moves. When you make a forest, though, new tiles will form at the front of the board, but only as many as the trees you used. So you want to try and use five trees as often as possible to get a full row at the front. The shifting tiles are what starts to steer this strategic game a bit more towards the stressful side of things than the relaxing side. Even if it looks like a serene wildlife scene, things can go bad pretty quickly if you’re not careful — and sometimes even if you are. See, you only have three lives. Hazards are what cost you lives. Something like a small wildfire that’s not dealt with in time will take a chunk of a heart, but if an obelisk or factory explodes, it takes a bunch of tiles with it, as well as an entire heart! Each hazard has a number that counts down each turn. When the timer runs out, you lose that health. Wildfires can be dealt with by sprouting a pond next them, thereby watering the grass. You can also use and animal to put out the fire if it’s next to it, but then it will go to sleep for several turns and be unusable until it wakes up again. You need to be careful not to put your fox to sleep too often, as the obelisks and factories can only be diffused with an animal. Occasionally, you’ll get lucky and a duck will appear in the water, so you’ll have a second animal to work with. But those hazards can sprout up when you least expect it, become unmanageable and ruin your day. Now, you may have noticed a couple of things from the screenshots I’ve included. First, there are holes in the map. Sometimes only one tile, and sometimes a massive chunk of the board is missing. You might also see that there isn’t always a way for the animals to get to the hazards to deal with them. So you’re wondering what you do in each of these situations. The solution is actually the same. Sure, you can create forests, but that will only get you so far. And the placement for anything less than five trees won’t help you with the edges. So what you can do to create more tiles and shift the landscape so the animal has room to move, is pull down on a column of tiles. When you do so, the whole column will inch up, and a new tile will appear at the bottom. But this is risky, as you could end up with more holes, or worse, an obelisk or factory. Those really only seem to appear most often when you force a column up, so you want to avoid doing it too much. But sometimes you simply have no choice. 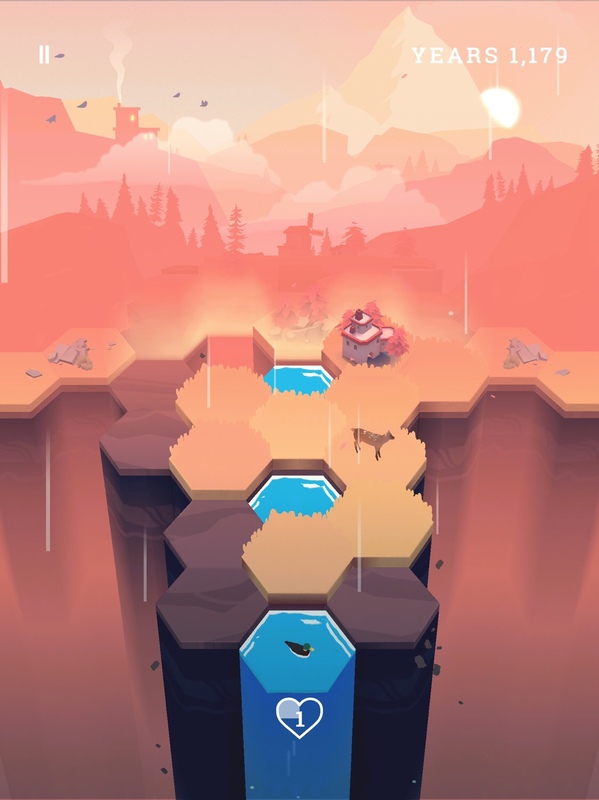 I mentioned that the visuals remind me of the Alto games, but that’s not all. 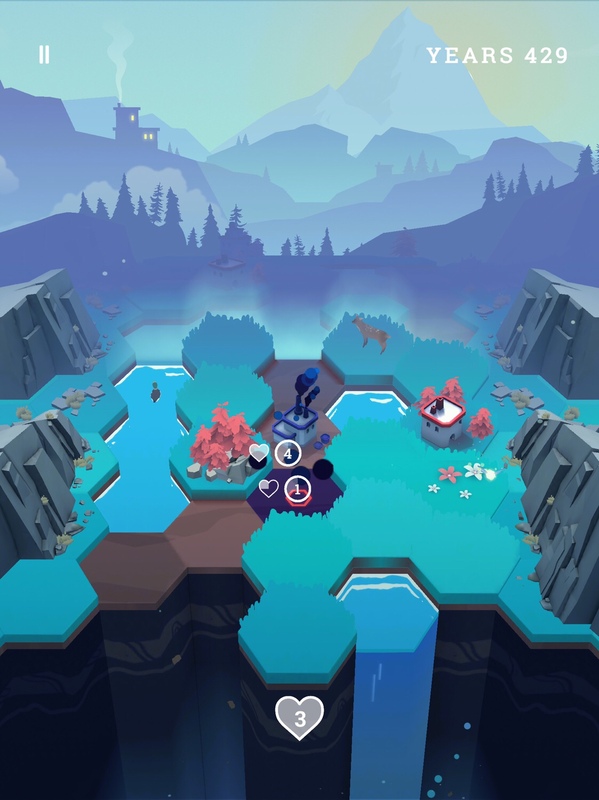 The gameplay is very different from Alto, but Valleys Between still borrows some other ideas from there. For instance, you have three quests to work on at a time. They could be to create three houses in a single world or keep an animal alive for a full season. Once you complete all three, you’ll level up and be given three more. It works exactly the same way as in Alto, as you don’t get any new ones until you complete all three. One of them was to collect a certain number of wisps in a world. Only the animals can collect them, and it often means going out of your way to get them, sometimes jeopardizing your world’s safety. It took me a long time to clear that one, and I couldn’t get any new quests meanwhile. That bothered me in both Alto games and it bothers me here as well. But on top of that, those wisps are used as currency for new animals and animal upgrades. You may have noticed that I keep talking about a fox but the animal in most of my screenshots doesn’t look very fox-like. That’s because it’s a doe. You start off with a fox, which is one of the small animals. 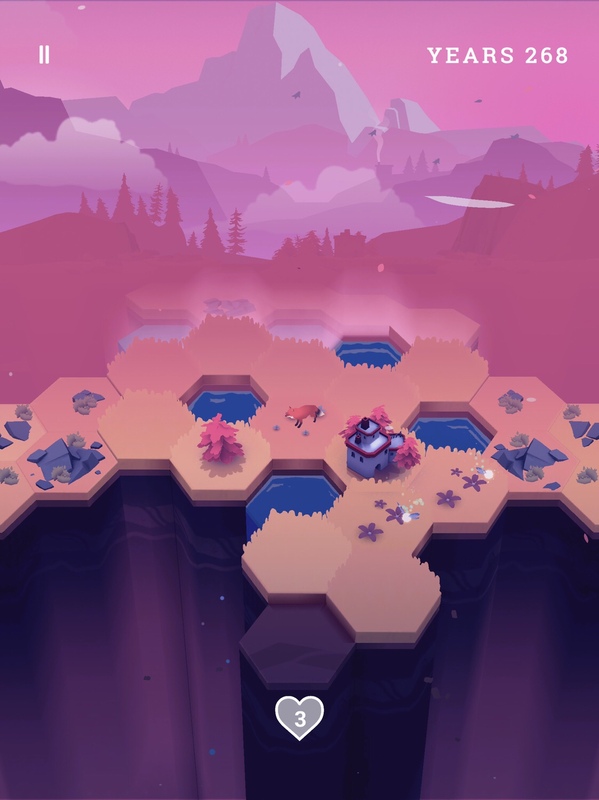 You can use your wisps to unlock other small animals, like a wolf, but that won’t give you any advantage, so I recommend waiting on that. 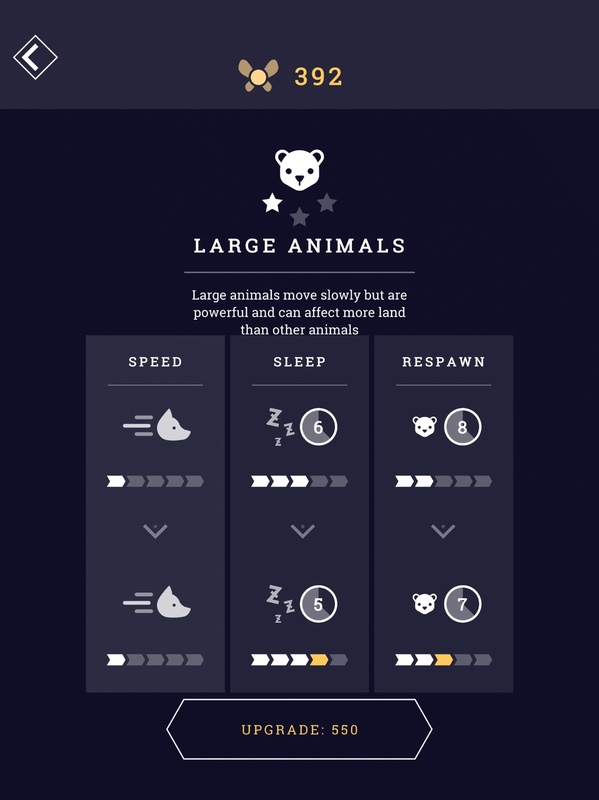 A better use of your currency is to either upgrade your small animals so they wake up from sleep faster, or to unlock medium and large animals. The medium animals consist of deer and moose, while the large animals are all bears. Many players will probably love having these unlock-ables, but I actually find they make the game feel like a big grind. This is for multiple reasons. First, it’s a high score chaser and you obviously have an advantage with the upgraded animals. Each animal has its own edge over the others. For instance, the fox sleeps less, but the deer can actually repair holes in the world. So there’s a trade-off, and part of the strategy is messing around with each animal and seeing which works best for you. I haven’t played with the bear much, and have stuck mostly with the doe since unlocking it. Perhaps I’ll find the bear is better if I give it a chance. But the problem is that unlocking them and upgrading them costs a lot of wisps. And meanwhile, I feel handicapped. Until an animal is fully upgraded, I’ll always be playing at a disadvantage compared to someone who spent more time playing and collecting wisps. It would perhaps be less of an issue if wisps counted towards your score, like coins do in the Alto games. But they don’t, so going for those wisps will never do anything for you in your current game, only your future games. This feels like a disconnect for something that is, at its core, a high score chaser. Sure, it gives you something to work towards besides a high score, but it feels more like an attempt to stretch out the game than actually add anything meaningful. 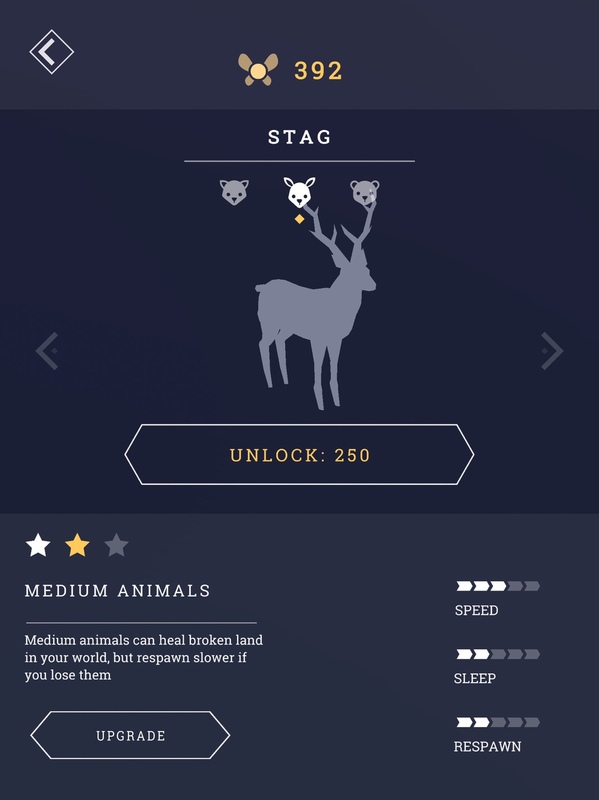 The real high score chasing will begin when you have all upgrades, and once you’ve unlocked all animals and upgrades, there will be no reason to even collect the wisps. So it feels like everything I do now is just to get me to that endgame where I can really just focus on the score. I understand some folks will only play a game if it has things to unlocked, but I think the relation between that and the high score chasing could have been established better than it is right now. 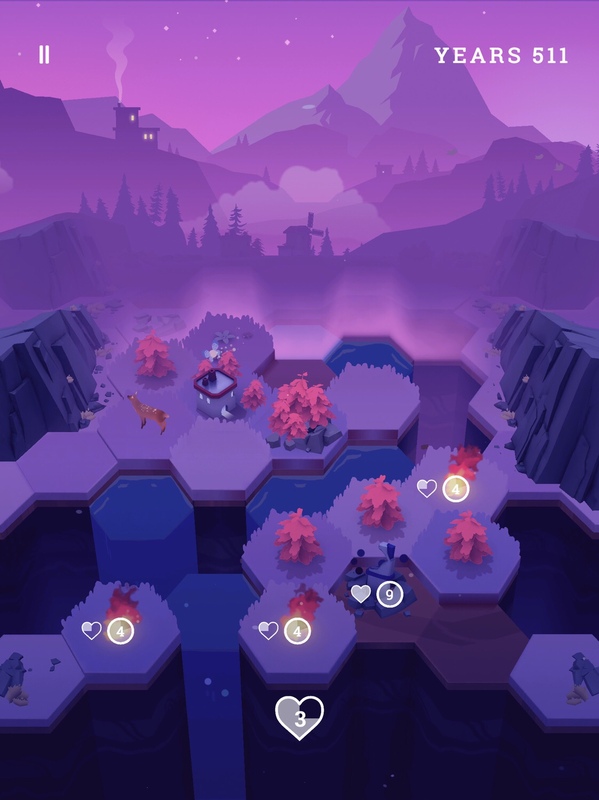 Thankfully, the game has iCloud sync, so you can enjoy the gorgeous visuals on your nice big iPad at home and then continue on your iPhone on the go. Unfortunately, there’s no landscape mode on iPad, so it’s always going to feel better playing on iPhone with one hand. I’m always looking for more turn-based one-handed games, though, so that’s not much of a problem for me. But a complaint I had with Evergarden was that it doesn’t save mid-game, and it’s the same story here. If you’re the type to play games in short bursts, that may be an issue for you. It’s also a strange choice, considering the game plays in portrait mode and would be perfect for making a move here and there throughout your day while waiting in line at the grocery store or wasting some time at work. Hopefully mid-game saves can be added in the future. Valleys Between is a much harder game than it appears. Don’t be fooled by its soothing artwork and nature sound effects. Nurturing nature is a difficult job and it will require much patience. Perhaps that’s a lesson the game is trying to teach us — we’re not going to save this planet overnight, but only through hard work that takes time. I was absolutely frustrated with the game at the beginning and almost quit after a few mediocre runs. But I’m glad I stuck with it and improved my strategy to the point that I’m second in the global leaderboards — even if there aren’t too many players yet. I’m not sure if I’ll manage to collect enough wisps to get all the animals, but I would like to see how the upgrades affect my score potential. There’s definitely a meaty game here that requires strategy and planning out each move, but luck also plays a part. This isn’t a game for everyone, but I think those who take the time to get better at it will find it can be a rewarding experience. And of course, the gorgeous atmosphere doesn’t hurt. 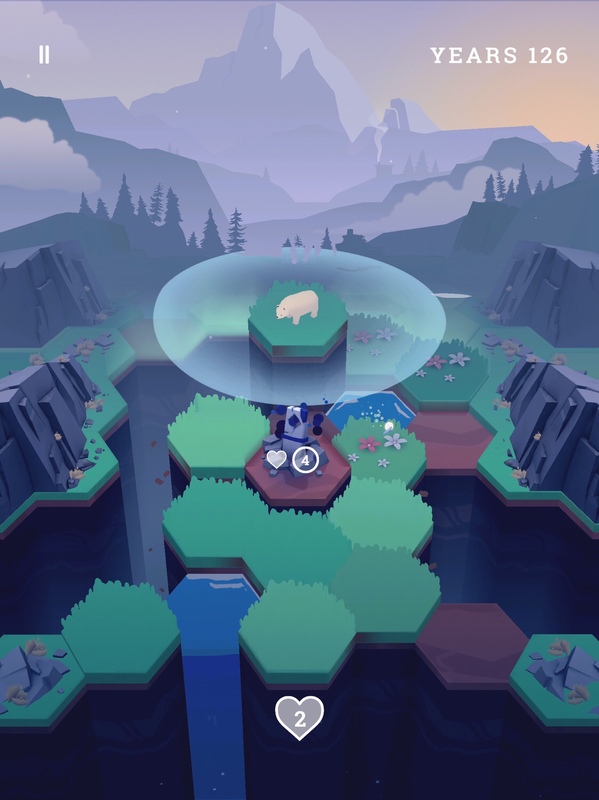 If you’re up for the challenge, you can download the game here and start saving the forest. And if you’re having trouble, try my walkthrough guide.